I am always eager to meet and talk to people who experiment and cook passionately. Walking in old fashioned markets, finding out new ingredients and using those ingredients in traditional as well as experimental ways is what interests me most. So much so I sometimes carry greens and vegetables from the places I travel. 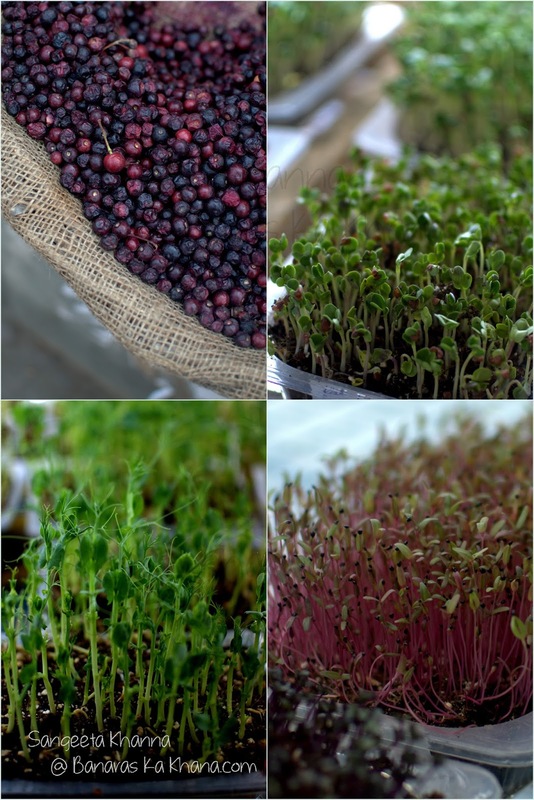 I have shared how I brought the freshest Haak greens from Leh and so many vegetables from our travels to Sikkim and Darjeeling. Recently I brought Mahua flowers from our trip to Bandhavgarh and packed some Palm fruits in my hand bag while on my way back from Hyderabad. Finding people of my ilk doesn't come by easy but there are times when the universe conspires in amazing ways. 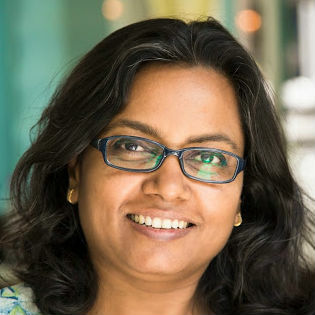 I was in Hyderabad for 'whole woman speaker series' where I was invited as a speaker and a very successful millet workshop when this conspiracy was being hatched. 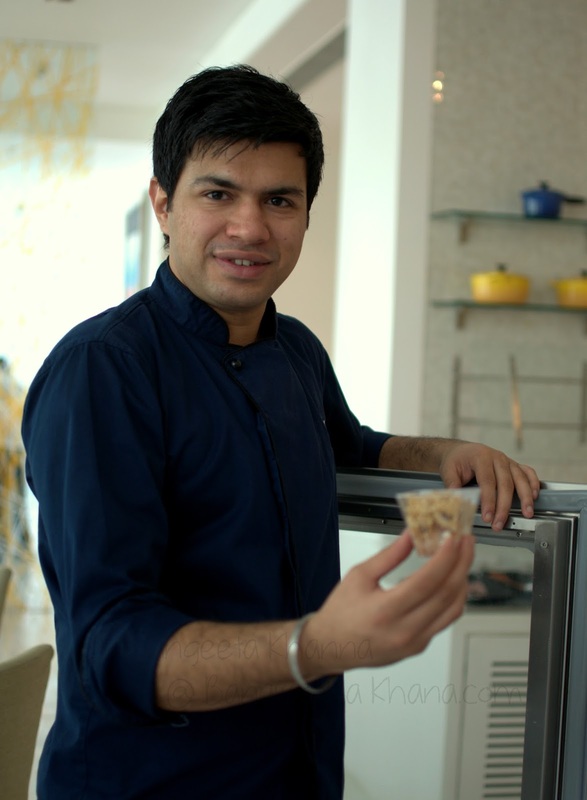 Le Meridien Gurgaon had curated a whole day with Tanveer Kwatra (the Executive Chef, Le Meridien Gurgaon) taking Deeba, Ruchira and myself to an action packed culinary journey and I jumped right into it within 12 hours of landing back in Delhi. I am glad I didn't feel lazy. 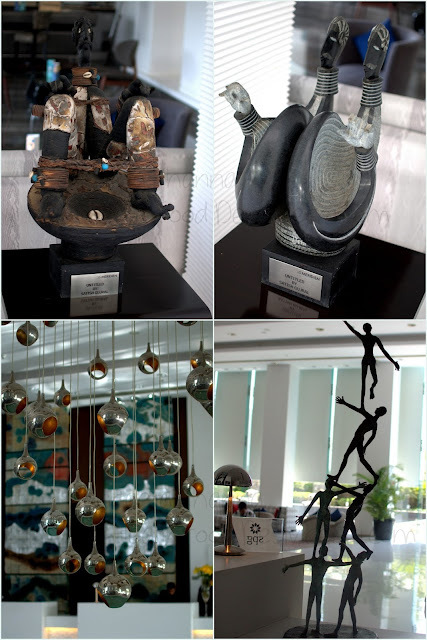 Early morning I was in the hotel lobby, surrounded with artworks of Paresh Maity, Sateesh Gujral, P R Daroz and the likes. We were received by the Chef himself, shots of Cardamom coffee and cumin infused mango juice came to greet us as Chef took us to Latest Recipe, the multi cuisine restaurant and cafe. 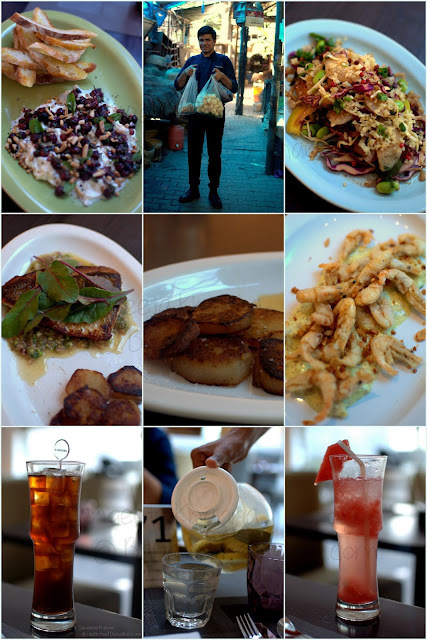 It is a well lit spacious restaurant that changes it's mood through the day as we witnessed later. Chef Kwatra treated us with a guided tour of the breakfast buffet before settling down for a double espresso shot and some fruits. Fruits are displayed quite interestingly at the restaurant I must add. It was a day planned with Tanveer where we had breakfast prepared by him, tasted the multicuisine lunch spread, had lunch in the staff canteen then went on to shop with him before he cooked dinner for us again. Totally an action packed day. 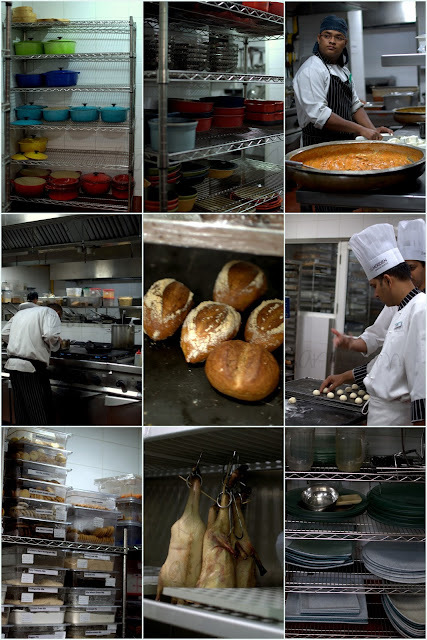 The day was made special by the affable and intelligent chef who shared his work experience and how running a kitchen like this is meticulous work that needs detailed planning. I could see how he is watchful of every single detail and multitasks in the kitchen all the time. It was fun to watch him in action. He cooked a special 'signature breakfast' for all three of us, breakfasts where they infuse local flavours with world cuisine and call it 'unlock the destination'. The signature breakfasts at Le Meridien Delhi is also a must try. I relished my crabmeat stuffed omelet with grilled tomatoes, bacon and hash potatoes. Ruchira had a Brioche burger and Deeba enjoyed her duck khurchan dosa served with mulligatawny soup and chutney. We had our breakfast sitting in the kitchen while it was being assembled live. Then Chef Tanveer took us to the dishwash section, the freezer rooms and the stores for fresh produce as well as dry grocery. It was good to see how a hotel kitchen is backed up by such efficient ingredient procurement and storage. We got to visit the microbiology lab where food samples are tested regularly to avoid food poisoning etc. We took a tour of the bakery section and saw pastries being assembled and decorated. It is an art and a science for sure. 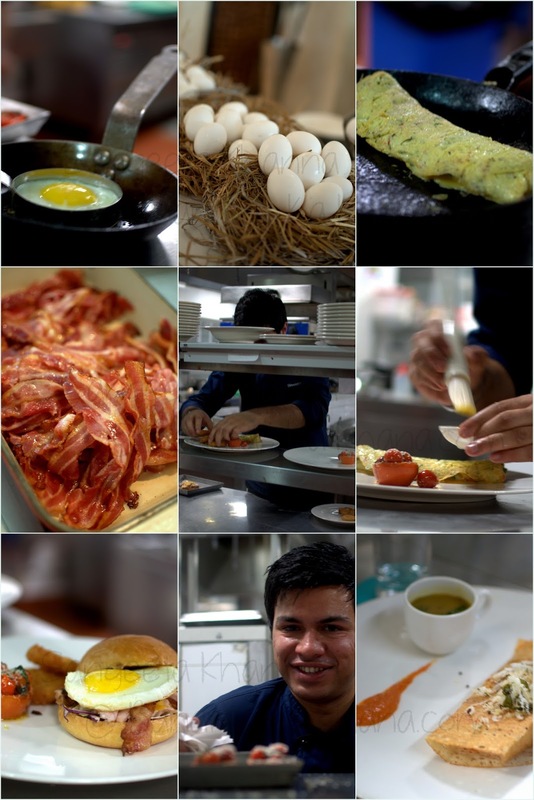 Good looking food comes from precision in executing it the right way. Bread dough was being punched and whacked. And then it was made into rolls delicately before being pushed into the oven. The golden baked rolls were brushed with melted butter and the aroma was intoxicating. 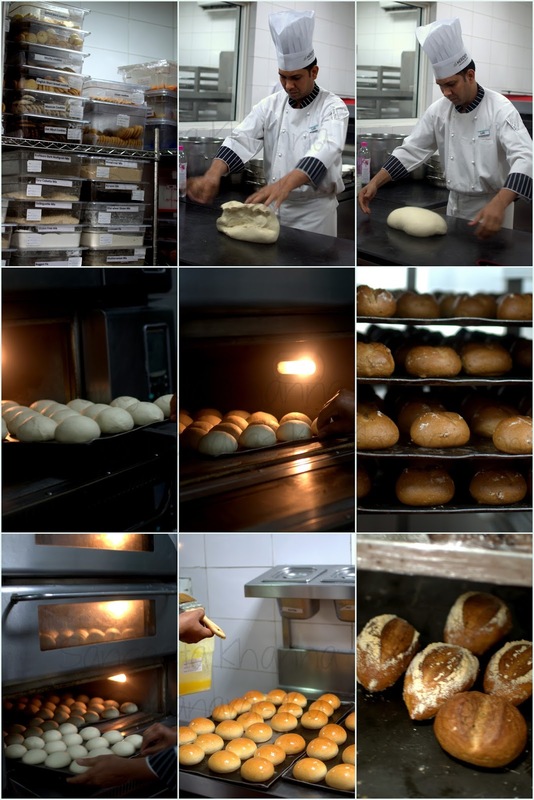 It reminded me that it has been ages I did not bake any breads at home. 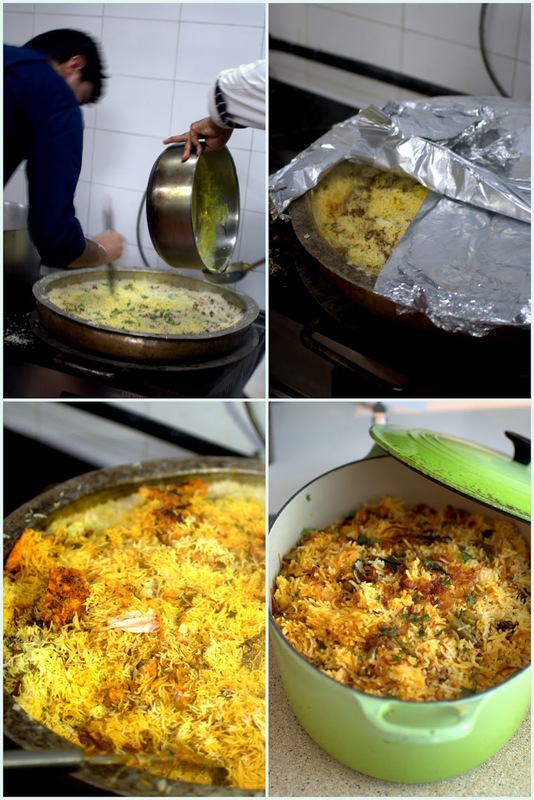 Biryani was being made into a huge copper Lagan (a flat base vessel designed to cook biryani) as we saw spices being mixed and ghee and saffron milk being poured into it. It was kachhe gosht ki Hyderabadi biryani. Later the biryani was unveiled and we had a taste of it. As the lunch buffet was being prepared by now, each of us grabbed a spoon and tasted many of the dishes. I loved the kaali daal makhni to bits. It was a really well made daal I had after a long time. The other impressive preparation was a fish in Beurre blanc sauce that we all loved. Tanveer asked if we like pumpkin and there we spotted a beautiful looking platted of roasted pumpkin with feta cheese. We could not stop eating this roasted pumpkin salad that was infused with thyme and garlic while being roasted with loads of olive oil. The Dhungar butter chicken (smoked butter chicken) was yummy. 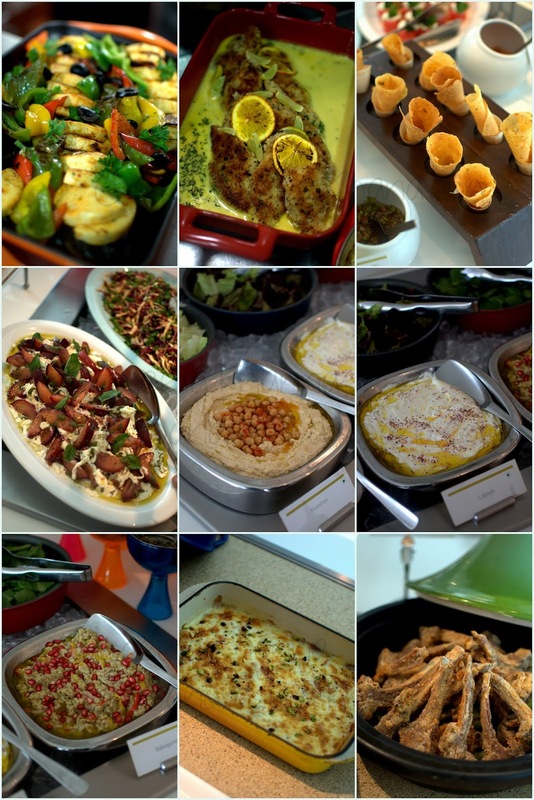 The spread of salads, raitas and desserts at the lunch buffet is quite impressive too. One can easily choose according to personal taste and dietary preferences. 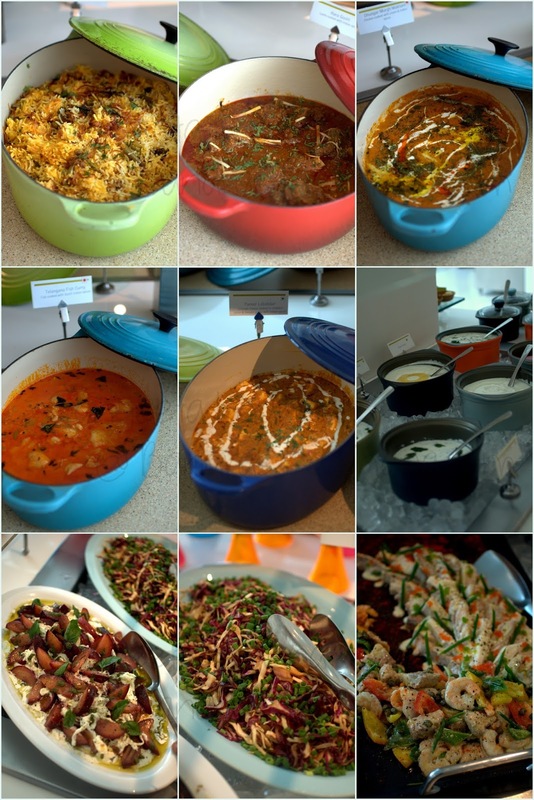 A variety of mediterranian dips and salads, roasted banarasi alu papad cones with chaat stuffing was interesting. And then we headed to the staff canteen where we 'tasted' the lunch of the day. There was no scope of having a full meal as there was a lot of tasting going on. 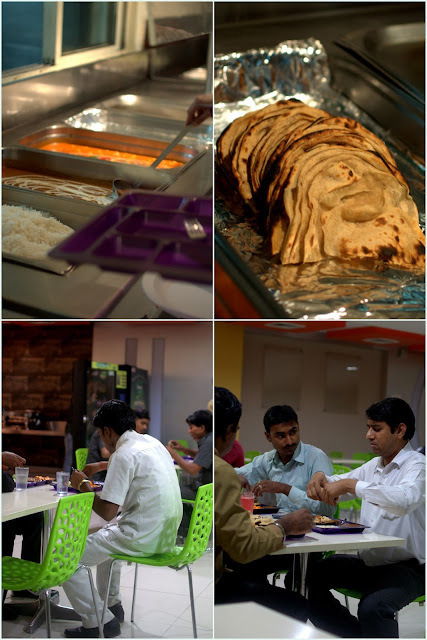 Canteen food was wholesome and delicious, it was a delight to see such efficiently managed staff kitchen. 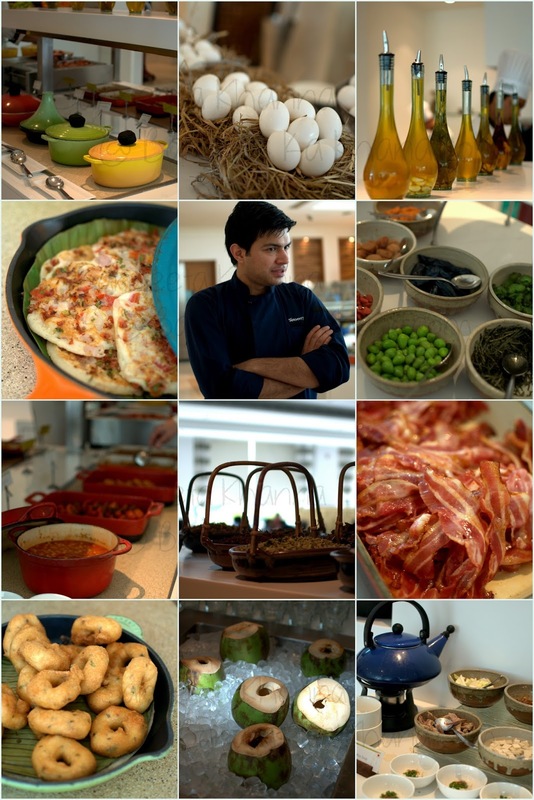 The GM of Le Meridien Gurgaon Mr David Hopcroft joined us for lunch at the canteen where self service is the norm and everyone picks up their own plates and disposes them to the washing area. We could see happy diners who must have come between work shifts. And then it was time to head to the market. It was very hot that day, equipped with cold towels, water bottles and sunglasses we headed towards CR park fish market. Some of these fish were to become our diner that day. 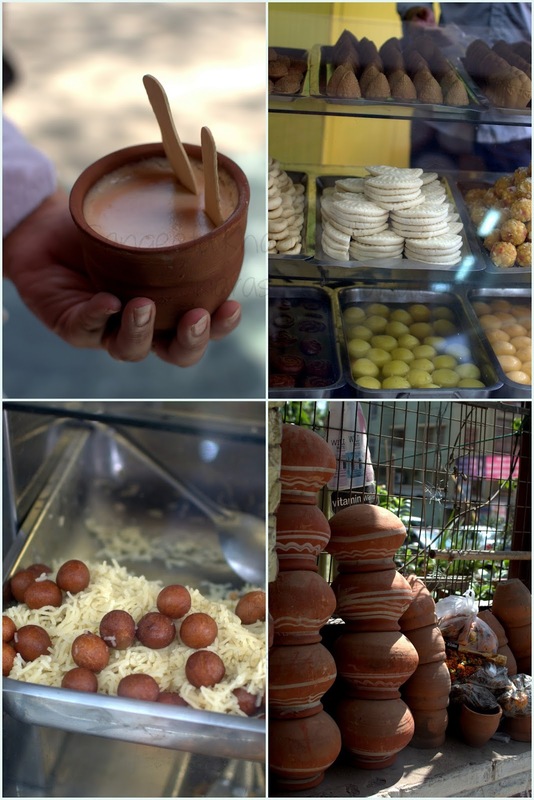 And then we went to Kamala sweets where Chef Tanveer bought some mishti doi and we sampled some of their specialties. A lack lusture jol bhora sondesh but really good radhabollobhi kachori and alu subzi. I love Bengali food and this shop is really good in the heart of Delhi. 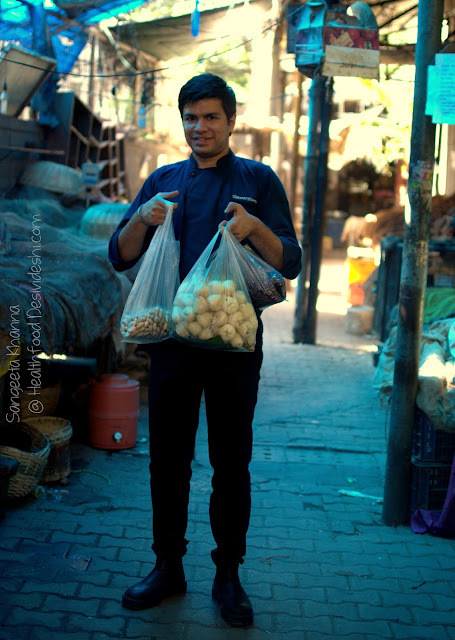 He also bought some Water apples (jaamphal) and Mango-ginger along with a few more vegetables to cook with. These markets are a pleasure to explore. You don't get seasonal produce from other parts of the country in supermarkets these days as they stock mostly the exotic produce and the everyday staples that have somehow become 'all season produce' in modern times. 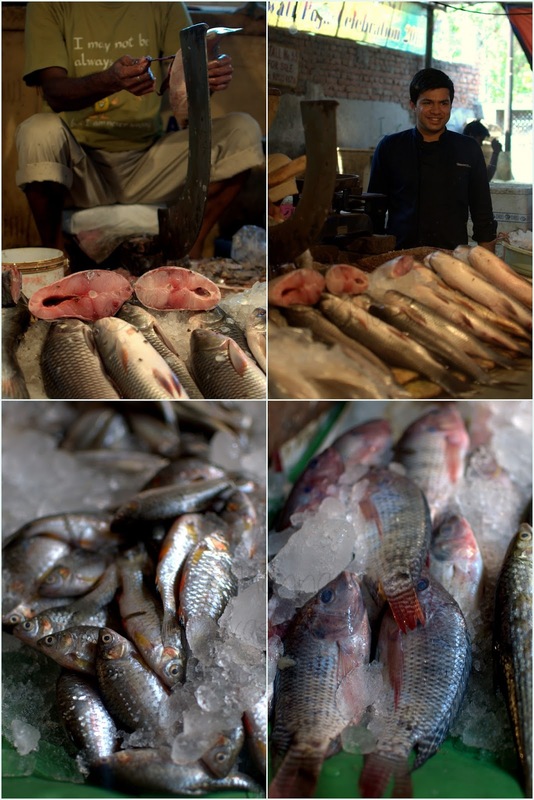 These markets in metro cities can't really afford to stock all local stuff but most produce is from within the country and is always seasonal. People who love the foods from back home throng to such markets to find the ingredients of the season. Tanveer bought some phalsa and then we moved onto a micro greens farm where he picked up some of these beauties. Back to the hotel we were exhausted and sapped due to the extreme heat. The hotel had planned a foot spa so I went in straight for that. Chef was at work preparing a dinner with what he had bought at the market. We were pampered royally you see. 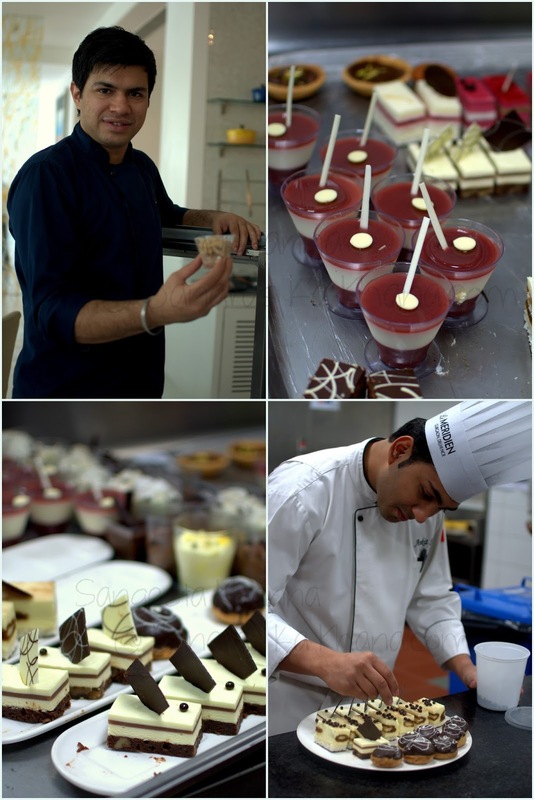 It is always exciting to see what we cook with freshly bought ingredients, Chef Tanveer came up with a few surprises. He had made a Caprese with fresh Burrata, basil and phalsa berries. This salad was so good we polished off the plate within a matter of minutes. Another salad was made with the water apples (jaamphal or jamrul), purple cabbage, mango-ginger and edemame etc and was a multitude of flavours and textures. The Sea bass was grilled and served with baby beet greens on a bed of mango-ginger salsa along with a side of caramelized sweet potato slices. Very creative and flavourful. Baby prawns were deep fried and served with kasundi sauce with bits of dried apricot and fried garlic. This was amazing with a really interesting take on kasundi. 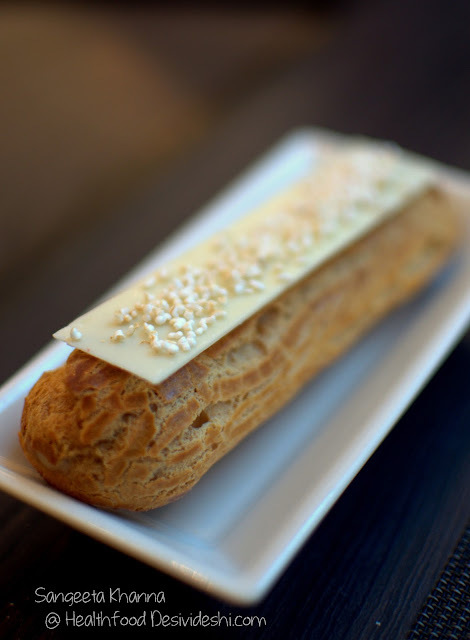 And there was this Mishti doi Eclairs topped with white chocolate and popped amaranth. The mishti doi from Kamala sweets was for this special teat. A little too sweet but addictive stuff. Beware. We had all our meals at Latest Recipe that day. Multitude of flavours but since we had small tasting portions it was not overwhelming. 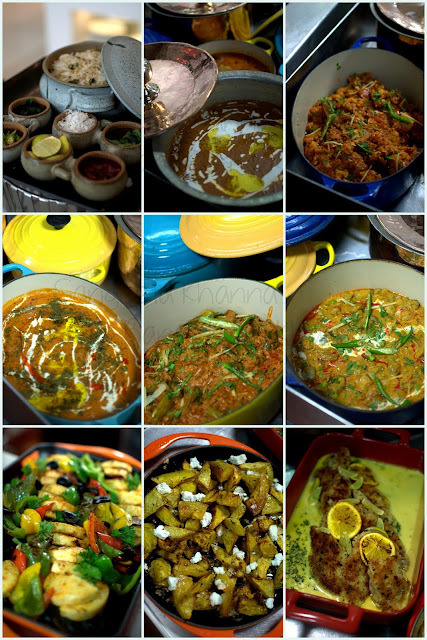 The best part of the day was that the flavours remained with me, I can recreate some of these at home or can go back again to Latest Recipe to savour the Roasted Pumpkin Salad or the Fish in Buerre blanc. Good food stays with you forever. Thanks to Tanveer Kwatra for being such a sweet host and Le Meridien Hotel for pampering us for a day.